Brewerytown is experiencing several large new developments at the western end of the neighborhood, adjacent to Fairmount Park. Along 31st Street, three large industrial buildings are being renovated into apartments and several new apartment and condo developments are being built, mostly by Westrum Development, which started the redevelopment of the former industrial area along 31st Street some ten years ago with a block of townhouses and duplexes between Thompson and Master Streets. Westrum is building up most of the block between Master and Jefferson Streets, on the west side of 31st Street, with three new apartment buildings. The block still has a large warehouse on West Jefferson Streets, across from the former Red Bell Brewery building which is being renovated into multifamily housing and retail. This large warehouse is about to be demolished and replaced with a new mid-rise apartment building, designed by Coscia Moos Architects. 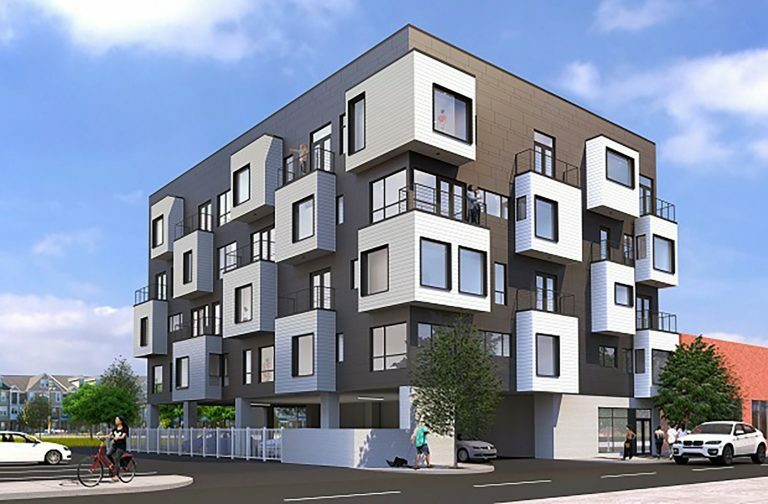 This new building will have thirty-two rental units in a five story building at 3120 West Jefferson Street. Most of the units will be one-bedroom units, but there will be a few studios and two two-bedroom units. The first floor will be used as office space for the as-yet-undisclosed developer of the project. The project will have ten parking spaces, half of them covered in the back of the building and half of them out in the open next to the building. The exterior of the building will have bay windows protruding out and terraces on top of the bays. The bays will have white metal panels and the rest of the exterior will be a charcoal gray color, creating a checkered pattern on the exterior. The top of the building will have a roof deck. The units will have “smart” technology, allowing residents to control their units’ systems through apps on their phones. Brewerytown is going through a dramatic change. As 31st Street continues to develop, Glenwood Avenue is also seeing new development, with the Eastern Lofts apartments and a new school. To the east, several smaller buildings and townhouses are being built and further east, the Blumberg Housing project is being completely rebuilt. Girard Avenue is seeing many new retail establishments opening up and several new multifamily buildings are being built on the avenue near Girard College. The new building at 3120 West Jefferson Street is a small, but complementary, addition to the Brewerytown building boom.